So today we’ll be talking about Colombian buñuelos, which just like the Colombian natilla, cannot be forgotten during the holiday season. They’re completely inseparable, made for each other, eaten both as one, and yet, not really because buñuelos are pretty much eaten all year round. Weird, huh? Colombians love their buñuelos which are served any time of year and any time of day. They even have street stands dedicated to making and selling buñuelos in every city. Yes, we are crazy about these round, fried cheesy, doughy balls. And how are they made? Well, remember how in my last post I told you that Colombians use corn flour, in this case cornstarch, for almost everything? Yeah, they use it to make buñuelos as well. They also use a special type of cheese called queso costeño which can only be found in Colombia. It’s a semi-solid, salty type of cheese that gives these cheese fritters that special flavor. Now, if you don’t live in Colombia, I’m pretty sure you’re already wondering where you can get this cheese. The answer is, you can’t. But in this recipe I have an alternative, which is the whole purpose of putting it up on the blog. I have tried all kinds of cheeses to make buñuelos and I finally got it down to two different types, queso fresco (fresh cheese), which is a semi-soft Mexican cheese and feta cheese, a crumbly, aged, Greek cheese that has a very strong flavor. 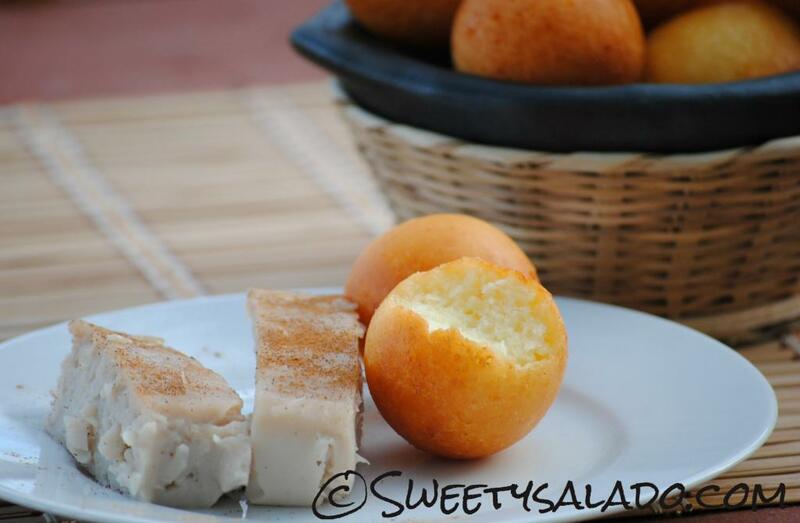 The combination of these two cheeses gives Colombian buñuelos the unique flavor found in queso costeño. Now that we have the cheese issue out of the way, we have to talk about the perfect frying temperature. When you ask a Colombian this question they will say “not too hot, not too cold”, which never helped me at all. I tried low, medium low, medium and even medium hot just in case but my buñuelos always exploded after putting them in the hot oil, leaving them deformed with these weird looking tails. I mean, they were delicious, but kind of scary. So after years and years (make that almost 15) of guessing the correct temperature, I decided to go “high tech” and use a deep fryer. I tried setting it at different degrees and found that the magic number is… (drumroll please) 325°F!!! Which according to Google, that’s 163°C for those living outside of the US. No more guessing and no more freaky looking buñuelos, 325 is the ideal number for my buñuelos. I suggest you try to fry them at different temperatures to see which temperature works best for you. But if you don’t have a deep fryer you can still try to see if you can get that “not too hot, not too cold” temperature with a big pot on your stove starting at medium low. They say the trick is to put a small ball of dough in the hot oil and wait 30 seconds. If the ball rises before 30 seconds, the oil is too hot. If it takes longer than 30 seconds, the oil is too cold. Try it, it might work for you! 1. Mix the first eight ingredients until you get a soft, smooth dough. If you find that it is too dry, add one tablespoon of warm milk at a time until you get the right consistency.2. Add the baking powder and knead the though until it is well mixed.3. 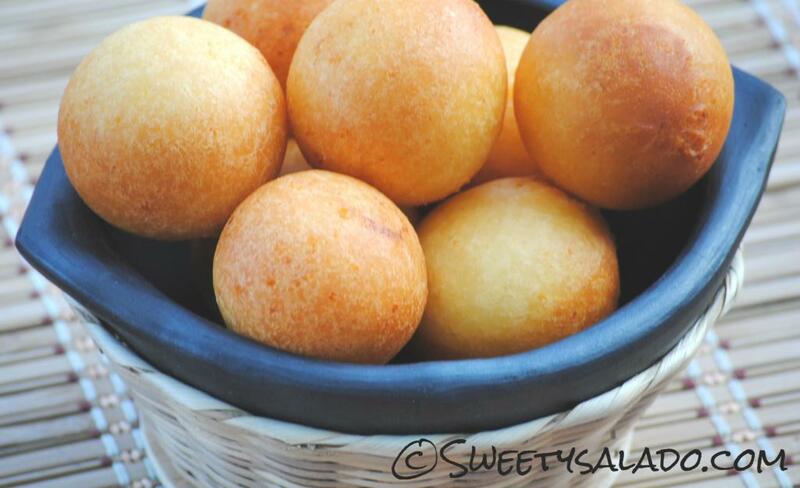 Shape the buñuelos by making small balls, about 1 inch(2.5 cm) in diameter.4. Heat up the oil in a deep fryer or large pot to 325°F (163°C) and add a few buñuelos at a time, leaving enough room for them to float around.5. Fry for about 20-25 minutes or until golden brown. 6. Drain with paper towels. Serve hot. **Note: The ideal temperature for frying is between 350ºF (180ºC) – 375ºF (190ºC). However, the room temperature, altitude and weather can many times affect the outcome. For this reason you will have to raise or reduce the frying temperature from time to time for best results. Hola, te sigo desde el foro de visajourney, y me parece genial este aporte. El mes pasado prepare buñuelos y fue súper dificil conseguir los ingredientes o el equivalente de los mismos aca en usa, como me hubiese gustado tener a mano la información que das en tu página. Los buñuelitos no me quedaron nada mal, solo utilice queso fresco porque no encontré más :P, no sabia lo de tapioca starch, pero ya se para la próxima utilizaré tu receta.Yo soy de cali, y de vez en cuando me gusta preparar sancocho y patacón pisao; estaré pendiente de tu página para nuevas recetas y la daré a conocer a mis amigos por esta zona para que se deleiten con los platos tipicos de nuestra tierra. Hola Diana, saludo cordial, has intentado hacer los buñuelos con quesito? Con mozzarella quedan espectaculares pero definitivamente el mejor buñuelo es con el queso costeño y ahora sí que lo están haciendo mejor x cuestiones higiénicas. Tienes mucha razón el queso costeño colombiano autentico le da un sabor exquisito , pero te tengo un truquito que te puede funcionar agrega a tu preparación por cada 150 gr de fécula de maíz una cucharada de queso parmesano.Puedes darle un vistazo a mi versión el blog http://thecolombiantouch.blogspot.ca/2014/08/bunuelo-colombianos-redonditos.htmlDianita me encanto el video , me encantaria ver tu version del pan de yuca que hasta ahora he tratado con mi horno que me queden perfectos pero me sigen saliendo algo chatos vi en un video de un chef colombiano que se debe al horno , los pan de yucas necesitan calor arriba y abajo y bastante cerca los primeros 5 minutos. Good Morning, I tried your recipe over the weekend and I think I may have used too much cheese. I was happy they were perfectly round, nice crust, and did not explode – But they were very dense. 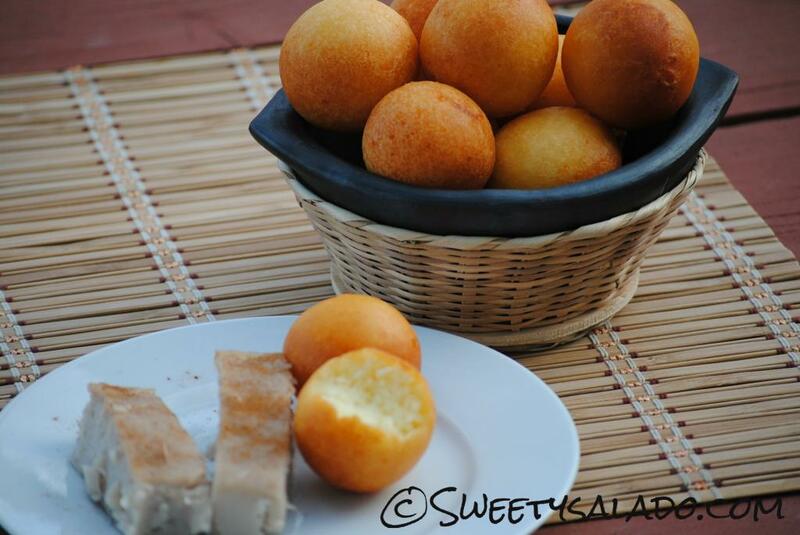 The buñuelos from the local Columbian restaurant have soft, moist, spongy, cake like interior. Do you know how much queso fresco you use by weight to make up the 3/4 cup? The amount could change depending on how fine it is grated. I used about 9 oz to make up the 3/4 cup. Thanks for the recipe, I enjoy reading your blogs, and look forward to making these again with (hopefully0 a tip or two from you to make these a bit lighter. THANKS! Hi trazam try this:remplace a part of baking powder for baking soda.remplace a part of egg by milk. Good afternoon. Thank you for posting an easy way of making Buñuelos. I had a great time making it but like trazam1986 my Buñuelos turned out the same. Now I know what kind of cheese to get. But I do have a question on the measurement on the cheese. Is it 11/2 cups or 3/4 cup. Thank you. Thank you for your fast response. I have one more question for you. What is the difference between tapioca starch and tapioca flour? No, you can't. Well, you can but they're going to come out mushy and too dense on the inside. The tapioca flour or starch is what makes them crunchy on the outside and spongy on the inside. Hola me alegra mucho haber encontrado esta pagina, anoche hice buñuelos con todos los ingredientes pero la masa no me quedo perfecta, estaba muy pegajosa y se me quedaba en los dedos entonces le agregue un poco mas de harina tapioca y quedo bien, despues lo eché en el aceite pero éste no quedo en la temperatura adecuada asi que los primeros buñuelos no quedaron bien, no se si tambien tuvo que ver la harina de más que agregué, no creció la masa en el aceite despues al resto le agregue mas baking powder y si me quedaron bien, pero no estoy muy segura de la temperatura del aceite porque además no tengo como medirlo. De todos modos es mi primera vez buñuelos y no quedaron nada mal. Gracias por tu pagina. Hola Diana!Yo tengo dos preguntas yo encontre un queso llamado fresh ‘homestyle’ white cheese from colombia eso es lo que dice. Este es el queso que necesito? Tiene los mismo ingredientes que el queso fresco de mexico. Si tengo ese queso que compre necesito tambien feta cheese? Ya yo tengo el queso pero solo quiero asegurarme si tengo que jacer la mezcla con los dos quesos y si es el queso correcto. Es que mi novio es de Colombia y vivimos aqui en USA y yo solo quiero que los buñuelos me queden al mismo sabor de los de Colombia si es posible! !Me encanta tus recetas gracias!Siempre veo tus videos y me encantaria que en tus descripciones hables mas de los ingredientes de como se pueden conseguir en USA porque casi siempre son nombres diferentes tu sabes en ingles.Gracias de nuevo! I find it at a Latin store in the town I live but you can also buy it from Amazon or amigofoods.com. I've also found it at Whole Foods but in all honesty, I don't think it's as good as the Latin brands. Diana, por primera vez despues de 8 anos puedo decir que los bunuelos me quedaron perfectos, con ese saborsito que es, suavecitos y redonditos. Lo unico que cambie fue en lugar de utilizar dos clases de queso utilice uno que se consigue aca en Holanda en el turco (Zachtekaas in Pekelwater). Ayer disfrutamos de unos ricos bunuelos con natilla, seguro los voy a repetir en estos dias de navidad. Unas felices fiestas! Pregnant and craving these bad boys at 11:32 pm. So I try and make it but for some reason my dough is not binding at all. I added a tad bit more starch and it's still not working ��. I think the cheese was kind of wet in the packaging. What should I do? Hi there! Thank you so much for wanting to make the recipe! Fixing the dough should not be a problem at all. If it wasn't binding, it's because it was a bit dry, in that case all you have to do is add a little bit of milk to it until it's nice and smooth. Start by adding a tbsp at a time, that way it won't get too wet. Let me know if that works! Yes, the cheese can come very wet but you can pat dry it with a paper towel before grating it. The egg your using could also be a bit bigger and that may add more moisture to the dough. This reminds me of one time that my sister was helping me make buñuelos and went overboard with the milk. The dough looked like oatmeal but all we had to do was add a little bit more cornstarch and tapioca starch to make it firmer. What type of butter did you use (tub or stick)? What brand feta did you use? Hola Adriana, puedes usar cualquier queso que no sea muy húmedo y que no se derrita muy fácil con el calor. Yo tengo que usar el fresco mexicano, que se parece mucho al quesito campesino colombiano, para darle textura a los buñuelos. El queso feta lo uso más que todo para darles sabor ya que el fresco es un poco simple. We've made you recipe previously and the Buñuelos came out amazing!! My Colombian in-laws told me I was an honorary Colombian. They felt like they were "home." Thank you very much. We are planning to make 30-50 Buñuelos for Christmas Eve. Is it possible to make them in advance and freeze them raw? We have a large deep fryer to fry them so they're freshly fried on Christmas Eve. That's wonderful Jennie!!! I'm so glad to hear they loved the buñuelos. And yes, you can freeze the formed buñuelos, freeze them and then fry them directly in the oil. You need to make sure to cover them well with plastic wrap so they don't dry in the freezer. What I do is place them on a baking sheet, wrap the whole thing in plastic wrap and put the baking sheet in the freezer. Hi Kimberly, I always use all of my dough because it tends to dry really quickly but you can try storing it in the fridge. As with most doughts, you will need to make sure it's well covered, either in a ziploc bag or airtight container. Hopefully, that will keep it from drying. Is it a glutenfree food? Since they're not made with flour, they are 100% gluten free. Hello, I'm part Colombian and last week we went to Cali to see my Grandma and family. I live in Arizona. I like buñuelos but my wife really loves them. Thank you so much for this recipe. They came out really good. I had trouble with the oil temperature but other than that they came out really good. There great for breakfast with chocolate abuelita.